Learn more about NSBE here. Christian Miller, Region V chairperson. When Christian Miller was growing up in Atlanta, Georgia, he wasn’t really focused on school and was a bit mischievous. College was definitely not the first thing on his mind. But a move to Waterloo, Iowa, to live with his aunt would change all that. 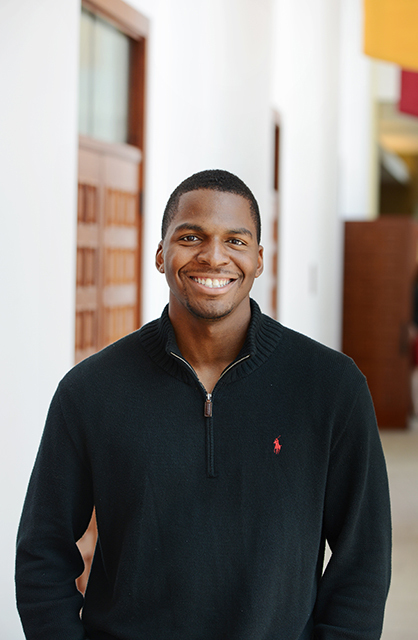 Miller, a senior in biological systems engineering, is now the NSBE (National Society of Black Engineers) Region V chairperson, where he oversees all chapters within the states of Arkansas, Iowa, Kansas, Louisiana, Missouri, North Dakota, Nebraska, Oklahoma, South Dakota and Texas. He’s also getting ready to graduate with his bachelor’s degree and preparing to pursue graduate education. His journey from where he began to the leader he is today started with an American Society of Materials International summer camp. That’s where he first encountered engineering. Then during his senior year of high school, he went with his aunt to St. Louis to attend the NSBE annual convention. He says the atmosphere of the convention was inspiring. He got to talk to different companies and participate in workshops, and he says seeing the sheer number of professionals in NSBE convinced him the group was something he wanted to be part of when he went to college. Miller landed at Iowa State after visiting campus. He says the interaction with professors and students along with the classrooms and laboratories drew him to the university. He received two scholarships: The Hixson Opportunity Award and The Multicultural Vision Program Scholarship, and he was set to start his journey as a Cyclone. Biosystems engineering was sort of a chance finding for Miller after he moved from business to undeclared engineering. “I didn’t want to take a semester of general engineering, so I went to my adviser and picked the major with bio in the name,” Miller laughs. As it turns out, the major was a great option for Miller. Once he’s finished with school, he’d like to work with the government or nonprofits that focus on alternative, renewable energy integration. The next leap for him was NSBE region vice chair—a challenge Miller was nervous he might not be able to pull off. “I gained a lot of experience and confidence in my role as vice chair. That knowledge has been helpful in my role as Region V chairperson,” he says. Miller is happy with all he has accomplished and is considering specializing in public policy for his graduate studies. He’ll be ready for the next level of education as he’s part of the Iowa State University McNair Program – a two-year scholar program that offers classes and training to prepare students for graduate school and beyond. He is also planning to run for the national programs chair for NSBE. “This position would be a good way to bring together my skills and public policy experience.” If Miller receives the position, he plans to run for the national chairperson afterward. After he finishes his academic studies, Miller will join the professional division of NSBE, noting that he’d even consider the possibility of joining the NSBE staff at the organization’s headquarters. Outside of his work, Miller likes to relax and decompress playing video games. He enjoys the outdoors and loves to travel, having already been to 31 out of 50 states and spent time in Uganda, El Salvador and Western Europe. I’m very proud of you CGreg you definitely ROCK!